Last month, whilst predominantly trying to focus on incoming reports of the highly publicised Thai cave fiasco, the Twittersphere (and the rest of the world) got caught up in a case study of what not to do on social media. 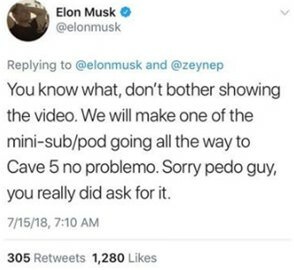 Elon Musk, the billionaire founder of Tesla, who is becoming increasingly known for his social media antics, found himself in hot water when his diving pod, which had been designed to rescue the 13 boys who had been trapped in a cave, was criticised for being unsuitable for the specific conditions of the rescue. Given the Unsworth's critical role in the rescue operation (the same operation in which another cave diver tragically lost his life), observers, including his 22.3 million followers, responded negatively to Elon Musk's outburst. 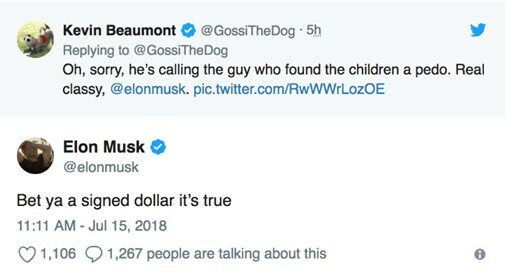 Musk proceeded by following up on his low-blow tweet with another, writing "bet ya a signed dollar its true". Making matters far worse for himself, Musk failed to issue a serious apology for a number of days following the initial #socialmediafail. 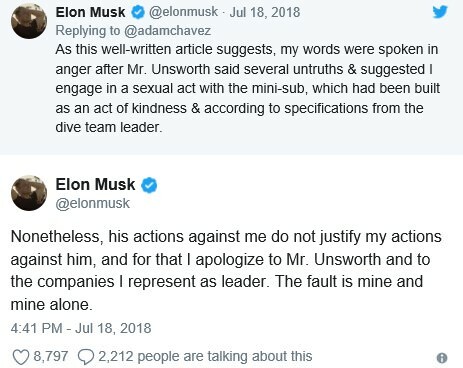 While Musk did issue an apology to Unsworth, although sounding sincere, it is safe to say that (as is often the case in this type of situation) the damage had already been done. What can we learn from Elon Musk's problematic Tweets? Don't tweet when angry: Coleman Greig's social media team has noticed a cultural shift towards 'shaming' online trolls, by actively mocking those users who look to unnecessarily criticize or offend others. Whilst this can, in certain situations, be an incredibly effective way to defend your brand and at the same time interact with your following (one notable example of this is singer/songwriter James Blunt's use of Twitter to interact with users in a humourous fashion), this approach is incredibly risky and does have the potential to paint you as the villain - especially if the public decides to turn against you! Don't joke about taboo topics: Most people would acknowledge that there would seldom be a time or place where the insinuation that someone is a child molester would be received well, or be considered funny - particularly when the rest of the world is actively labelling that same person a hero for the positive work that they've taken part in (as was the case with Vernon Unsworth). Coleman Greig suggests avoiding posting any content that might be widely construed in a negative light. Consider any sponsors or brands with whom you are affiliated: When a #socialmediafail rears its ugly head, it is possible (even likely) that any external organisations with whom you are affiliated will also start to cop backlash, simply due to the public's perception of your relationship. Following Elon Musk's initial twitter rampage, it was reported that Tesla's share price dropped as a result of its founder's online antics. With the ever-growing interconnectedness of social media and brand collaboration, there are growing pressures on businesses to ensure that they protect not only their own brands, but also the brands of any sponsors or affiliates. Be sincere in your apologies: While Musk did eventually apologise, many criticised the Tesla CEO for failing to appear sincere, genuine or remorseful. Instead, his tweet came across as defensive and seemed to serve as justification of his conduct. Coleman Greig recently wrote about the dangers associated with businesses issuing poor apologies, and would like to remind our readers of the importance of issuing a short and sharp apology in the event of a social media crisis. Have you ever been caught in a social media storm? Tweet @ColemanGreig and let us know how you decided to respond!